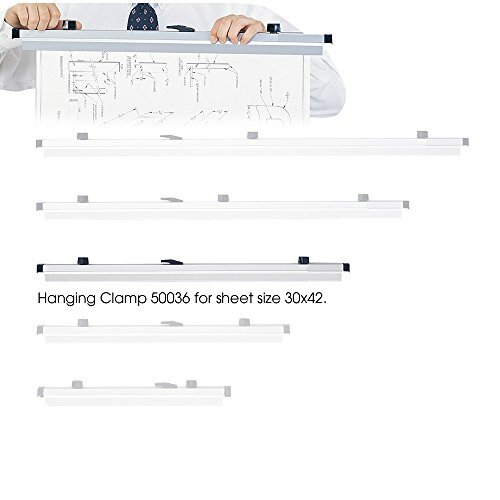 Presentation and filing is easy peasy with the strength and clever design of the Hanging Clamp. Bright extruded aluminum clamps with black nylon wing knobs provide balanced gripping tension and a smart look for presentation. Eye-ease clear plastic label holders make labeling your work a cinch. Each Hanger Clamp can hold 100 sheets or 20 lbs of your work and has a limited lifetime warranty. Give your work edge by using a Hanging Clamp instead.Presentation and filing is easy peasy with the strength and clever design of the Hanging Clamp. Bright extruded aluminum clamps with black nylon wing knobs provide balanced gripping tension and a smart look for presentation. Eye-ease clear plastic label holders make labeling your work a cinch. Each Hanger Clamp can hold 100 sheets or 20 lbs of your work and has a limited lifetime warranty. Give your work edge by using a Hanging Clamp instead. Vertical hanging clamps.30 x 42". Aluminum clamps with black nylon wing knobs. Packed six clamps per carton.Finished Product Dimensions:31 ¼"W x ¾"D x 2 ? "H.